As a player in this competitive industry, it is important to understand the importance of investing in packaging. Good packaging can help boost sales and generate buzz. Not only so, but it can also increase brand awareness and recognition. On the other hand, bad packaging can backfire and cause consumers to walk away from your products. This custom Durex packaging is a great example of how to attract and retain customers. 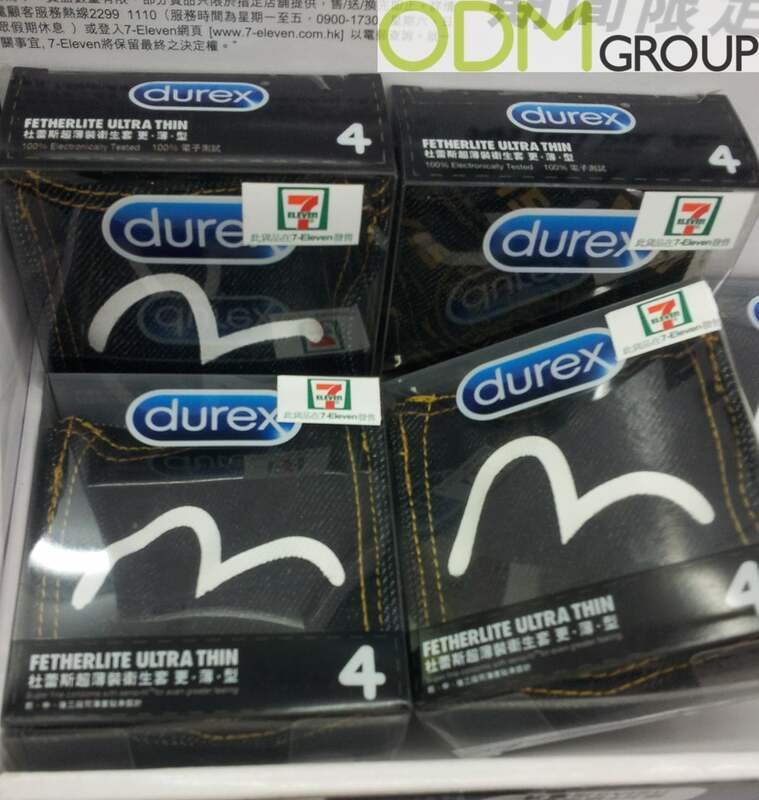 In this case, customers shopping at 7-Eleven stores can buy the product collaboration of Durex and Evisu – original denim brand. It is a new fashionable condom pouch, which resembles the pocket of jeans. This will successfully attract the attention of potential buyers because it stands out from the crowd. Such fun and interesting packaging allow Durex to have a competitive advantage. As a result both these brands have a benefit thanks to this collaboration. 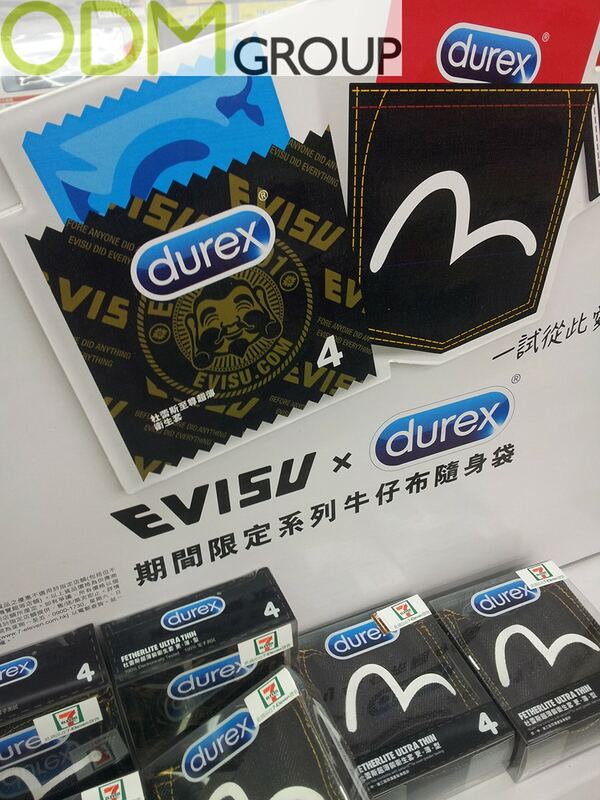 Durex gets trendy promo packaging, and Evisu company gets own logo promotion printed on Durex packaging. Furthermore, the brand collaboration will definitely boost your brand exposure. This is because there is a higher level of creativity – which brings us to a more unique and appealing design to consumers. On top of that, your consumer base will also increase – this collaboration is now targeting the loyal customers of Durex and Evisu. Customers attraction. When companies change the style of promo packaging they are more likely to attract new customers. This is because usually, people pay attention to new things. These condom promo pouches look stylish and surprisingly different compared with usual condom box packaging. Full Custom. Designing the package, companies can make use of certain colors, patterns and shapes to entice the target audience. Packaging boxes can also make your brand more valuable and more expensive. Custom packaging also offers a big branding area, so it is the best way to communicate with customers. It is also quite discreet which may make customers choose to buy over other leading brands in that same industry. Product protection. This custom packaging is actually an essential item for condom production. These branded pouches are made of good quality denim, and the material is more durable than cardboard. These denim pouches are able to protect against damage, in this case, you must be sure in the safety of the initial product. Boost your sales. Because your product will become more unique and more appealing to the customers, it will result in an increase in sales. This promotional item has a zipper, so can be used in the future due to its durability. This gives added incentive for others to buy it due to the idea that people will receive more for their money. Our product designers at ODM will be able to provide you with ample designs to allow your brand to stand out among competitors – which is extremely crucial in a saturated market. Our specialists will be assisting you through every step of the process and such as designing, sourcing, as well as manufacturing. Contact ODM today to find out more about how you can vastly improve your business! How can brands attract customers with a well-managed point of sales packaging? This blog talks about some booths that caught our attention during tradeshows, and why we love it! Check this out to learn how to also successfully come up with an attractive point of sales packaging!